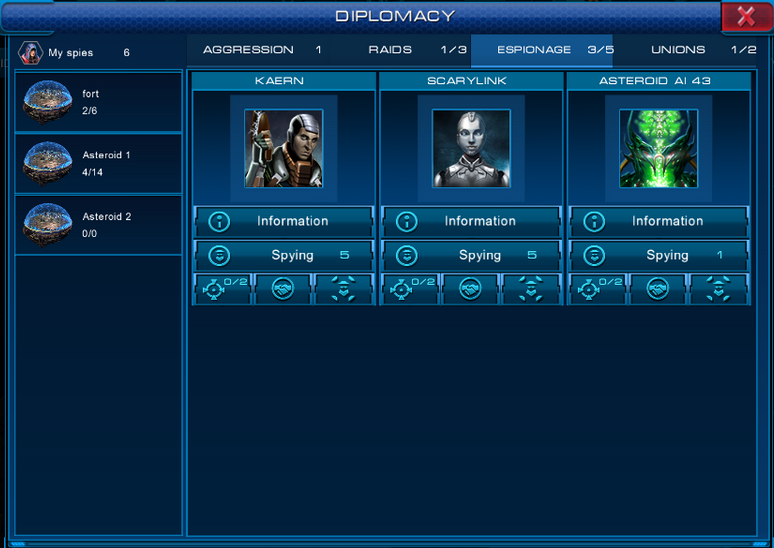 Diplomacy is a special window that allows the player to see aggressions, pirate raids, espionage and alliances. To open it, the player needs to hit corresponding button in the top panel. Aggression tab shows those Lords who spied on the player's asteroids or attacked them. Raids tab shows pirate raids commited by the player, and also displays the number of available slots. Espionage tab shows the player's espionage activities, and also displays the number of available slots. Alliances tab shows those of the Astro Lords with whom the player made an alliance, and also displays the number of available slots. This page was last modified on 28 April 2014, at 19:12.